More photos of railtours in our area. 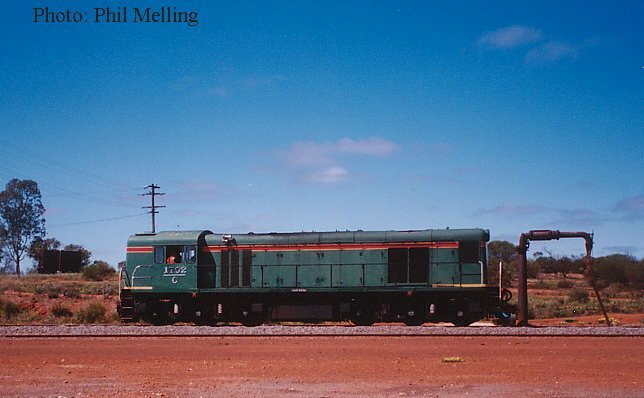 Not strictly a rail tour but prehaps qualifies as a hired special, C1702 stands at Geraldton Port with the W.A. version of the Employment Express on 13 November 2002. 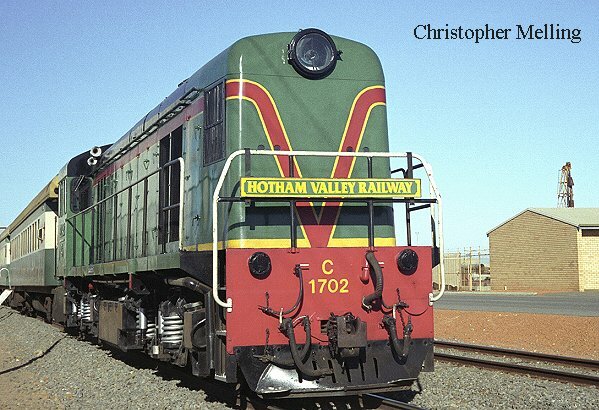 Hotham Valley members had repainted the C only a few weeks previously. This photo is also the first on our site taken by Christopher our 8 year old son and Davids younger brother. 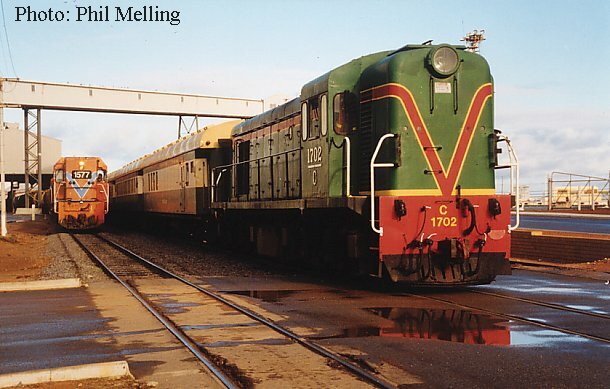 Most of the railtours now arrive and depart from the Geraldton Port adjacent to the Geraldton CBD, here we see C1702 waiting to depart with a tour train to Mullewa whilst DA1577 unloads a grain train on 29 August 1999. 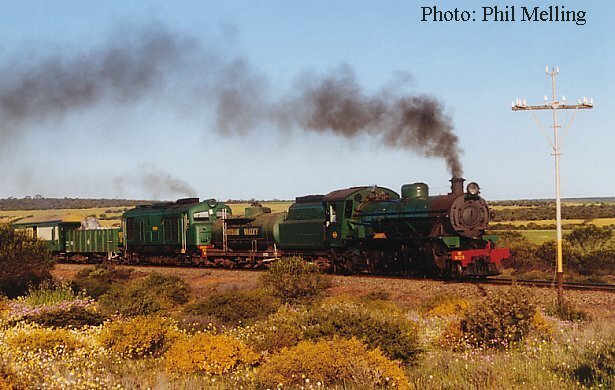 W903+XA1401 head towards Mullewa passing the wildflowers near Tardun (between Morawa & Mullewa) on 22 August 1998. W903+XA1401 haul a Hotham Valley tour through Bunjil (south of Perenjori) on 22 August 1998. The tour earlier that morning had left Dalwallinu to the south and traversed the now closed section of line between McLevie & Maya. 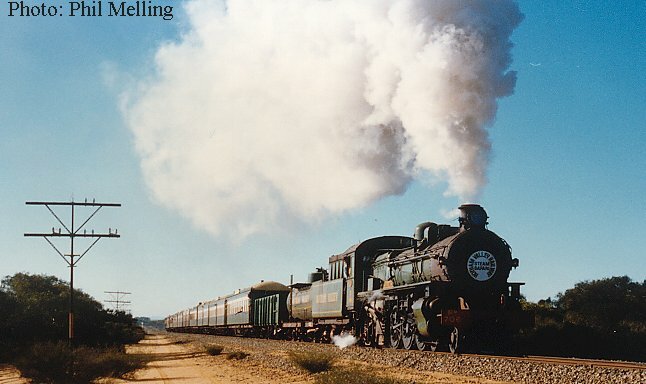 PM706 hauls a tour train near the Erangy Springs road crossing heading from Mullewa to Geraldton on 25 August 1996. 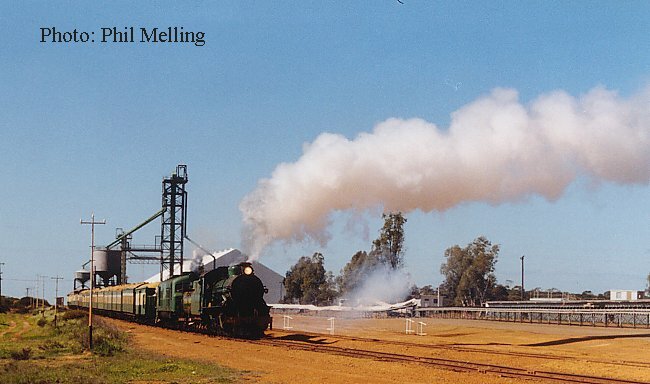 C1702 runs round a tour train from Geraldton at Mullewa passing the steam loco facilities still extant at Mullewa, the water tank to the left and water column to the right. Photo taken on 1 September 2001.